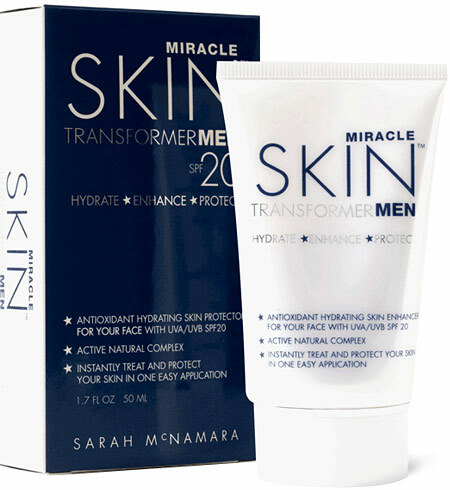 Miracle Skin Transformer Men ($48) promises a lot in the name alone. But the package also pledges to instantly improve skin's texture along with minimize imperfections and redness with a proprietary formula of naturally derived silicones, exotic fruit extracts and vitamins A, K and E.
We'd heard that guys were using the original Miracle Skin Transformer (released last year) before there was even a men's version, so when the "slightly tweaked" version landed on our desks we had to give it a try. Squeeze an M&M's worth of the lightweight, fragrance-free lotion onto your fingertip and rub into your face and neck. You can use it daily as a morning moisturizer because it's got an SPF of 20. Not surprisingly, it was the non-product-junkies that were most taken by the all-in-one lotion. It smoothes on easily, absorbs quickly and keeps your face shine-free all day. It's not sticky, which is rare for any sunscreen. Their only complaint was the cost. But since you only need a small amount, the 1.7 oz. tube will last you at least three months. Plus, it barely takes up any space in the medicine cabinet.